Families are almost as unique as fingerprints. You may remember that strange feeling you had as a child when you entered the realm of another family. How you would notice all those little things that were different from your own tribe’s habits; the way the eggs were cooked, the way the towels were folded. As we get older, we see more of the similarities between us and others, I think. Those small things become such a part of us we no longer notice them. It is our children, now, who take them in, for better or worse, as we become our own strange, one of a kind families ourselves. 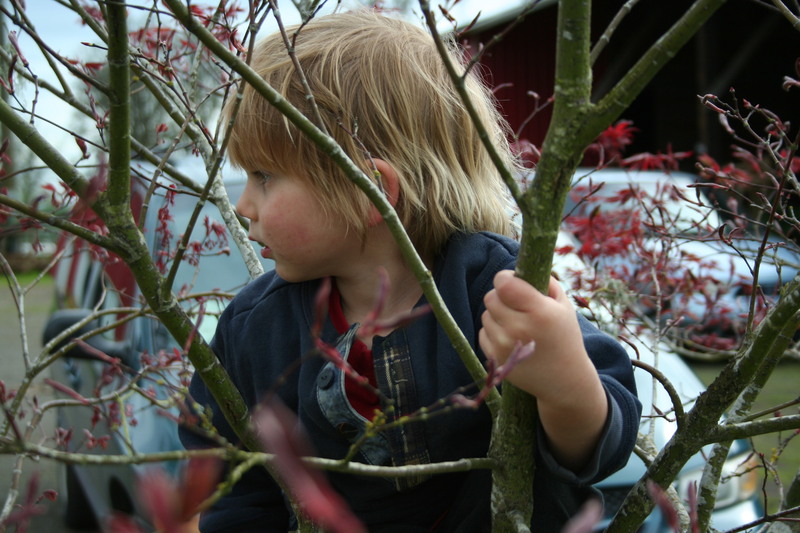 I am thinking about this because over here, our smallest child climbed his first tree a few weeks ago. He was so proud, it was so darling. And it struck me in that moment that this was kind of like a right of passage in our household. Although I am the odd man out in this regard, the rest of my children, from the beginning, like their father before them, aimed to find themselves up in those treetops as early and as often as possible. For some parents, this would be nerve-racking. But for us, it has come naturally. As this little guy grows into himself, as well as into this family, I can’t help but notice those things that remain steady and constant for us, from the first through the last. We, the parents, have grown tremendously in these last twelve years of parenting, but I am surprised to see that the core of our family has remained much the same. It makes raising this fourth child kind of a breeze. It also makes for a solid foundation. The farmer and I didn’t talk about a lot of things when we threw caution to the wind and fell head over heals for each other nearly upon first sight. We were ready to start a life and family together almost from the beginning. Things like career plans, financial goals, lingering hurts and fears from our own childhood’s, and so on–that seemed trivial to us. What we did talk about was how we would raise our family, and how that would be the most important thing we would do. In the end, that has made things easy in a way that I think can be hard in relationships and in parenting. We knew what to do and how to remember what to value even when those other things made life hard. Love is a word that can mean so little when we say things like it is all that you need, because those other things are important and real and we have to deal with them in this life to really fulfill our destiny. But, it is also a word that can mean everything, that can really be the basis for how you make the other things work in your life so that you always have strength and a solid place to help you weather through life’s ups and downs. It is our foundation out here, and so far, I think that it is a wonderful, expected truth my children are experiencing. We certainly have our own weirdnessess, things that my kids will probably wear next to their skin for the rest of their lives because they are a part of this family. But those are the kinds of things that enliven the world anyways. Loving your own idiosyncrasies and loving others are the two sides of the human coin. 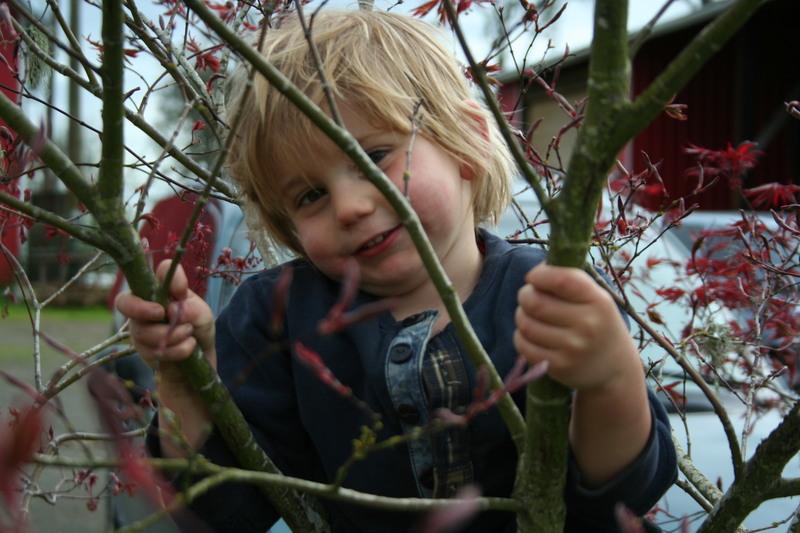 So, my little tree climber, I can only say to you, welcome to the fold, sweet one. We are so happy to be your family. ← a bowl full of sunshine~lessons from the wild.